Set back your thermostat: A programmable thermostat is the easiest way to adjust your heat setting depending on the time of the day, but manual adjustments can be performed as well. Typical programmable thermostats allow you to have different settings for the weekend vs the weekdays, and more advanced ones allow you to have different settings for each day of the week. It is recommended to lower the target temperature in the evening and during times of the day that no one is occupying the home. 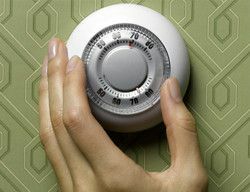 For every 1 degree you lower the thermostat for 8 hours, you can save 1% on your heating bill. Therefore, if your normal winter setting is 68 degrees, when you roll back the temperature to 58 degrees for just 8 hours of the day, you will save 10% on your heating bill! Programmable thermostats are also great for the summer in eliminating the overuse of your air conditioner. Supplemental heating sources: The addition of a space heater or whole-room heater in a room that you occupy for long periods of time will make those rooms feel more comfortable when the thermostat is kept at a lower setting. These savings are only noticed if you are able to keep your thermostat set lower as a result. Improve insulation around windows and doors: Heat escapes our homes in many ways, but windows and doors are often the biggest culprit. The good news is that there are many ways to improve this situation. Window insulation is one of the most popular remedies. If you ever wondered how much window insulation helps to lower your heating bills, you may want to reference 3M’s energy savings calculator! By just insulating 6 average sized single pane windows, you will see a savings of about $36 dollars for the season (or about $26 dollars for double pane windows). Not only does this save money, but it will make those rooms more comfortable as well. Simply pulling windows blinds and drapes up during periods of sun and closing them during the evening can also protect against the transfer of heat through windows, but not to the same degree as the film does. You may also want to check for leaks around windows and doors and fill in the cracks and crevices in those areas. You can do so by applying removable weatherseal caulking (such as Dap’s Seal ‘n Peal) or transparent weatherstrip tape. If the leaks are where doors or windows open and close, you may want to consider using rubber or foam insulating tapes to fill in the gaps. The bottoms of doors and be an issue as well, so the installation of rubber door sweeps or the temporary use of a door draft dodger will often do the trick. Insulate around switch plate covers: This is another easy step that often is overlooked. Switch plate insulators are essentially foam pads that are pre-cut for your outlets or light switch covers. We recommend placing them behind switch plates around the exterior faces walls most importantly, but you can also use them on the interior walls as well. Fill in gaps and cracks in basements, garages, attics, or storage areas: Use insulating foam sealants, such as Dow’s Great Stuff, to reduce drafts caused by gaps around wiring, plumbing penetrations (under floors or beneath sinks), or HVAC ductwork, and in basement or crawl spaces. This foam is not best for finished living areas, but in rooms where the appearance is not an issue, there is not much easier than this expanding foam that fills gaps and cracks of all sizes and shapes.